Here you can see how much better this is! I can see the titles of each podcast and thus know which week’s podcast I’m listening to. 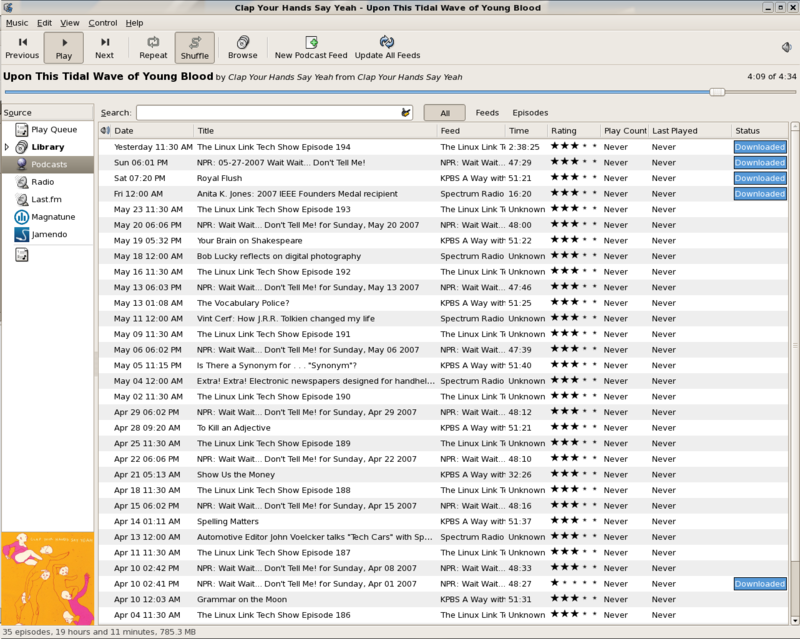 Also, Rhythmbox allows me to delete the shows I’ve listened to. In Songbird, if I delete a podcast it is redownloaded next time around. 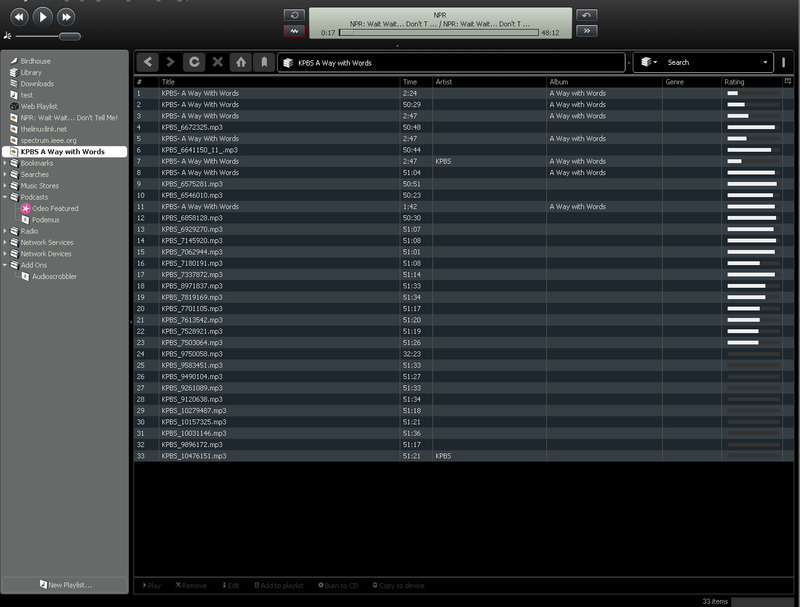 So far I’ve been using Rhythmbox all day long without any problems. I really like it a lot. It may become my new default player for Gnome and Gnome-like environments like Xfce. Eric, I’m glad you’ve given Songbird a test flight, and I’m glad you’ve filed a bug for the podcasting meta data bug too. 0.2.5 is still a preview/alpha so please forgive us for the bugs. Since 0.2.5, we’ve taken a step up, re-organized, and re-written a bunch of Songbird for 0.3. 0.3 represents the first release on our new code path. It will be reasonably faster, more stable, and will address as many user-feature bugs as we can fit into our QA cycle. Thanks for responding! How did you find my post, if I may inquire? I’m sorry if it came off as an attack – I only meant that it currently didn’t meet my needs and that pushed me to get my podcasting needs from Rhythmbox. I must also say that Songbird is definitely the best player on Windows. I upgraded to the latest WMP and it feels so broken – even worse than you guys and you’re alpha/beta while they’re not. Keep up the good work and I’ll revisit soon.